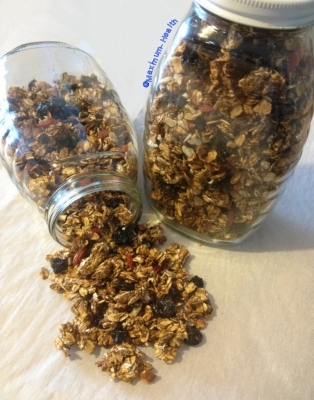 Granola is one of my all-time favorite snacks and it can be extremely healthy! Unfortunately, so many companies add unwanted sugar and fat to their recipes. This granola is perfect without added processed sugar and unnecessary fats! The chocolate adds a great kick to go along with the pumpkin and this recipe is a hit with anyone. Preheat oven to 325F. In a large bowl, combine oats, cocoa powder, cinnamon, and pumpkin pie spice. In a separate small bowl, mix together pumpkin puree, unsweetened applesauce, maple syrup, stevia, vanilla extract, and almond milk. Add the wet ingredients to the oats and mix together with a large rubber spatula until the oats are thoroughly coated. Once completely coated, put the mixture on a large baking sheet lined with parchment paper. Bake for 20 minutes. Stir once and bake again for another 10 minutes. Do this one more time, for a total of 40 minutes. After it's cooled, add chopped roasted almonds, pecans, sunflower seeds, and dried fruit.